The tech giant has released fixes and updated the patched work to deal with Foreshadow attacks on Intel Chips. Moreover, the security loopholes have disturbing the speculative execution feature of Intel CPUs. The company has also provided the security consultative to circulate the required vital information against the Foreshadow attacks. In this post, we’re going to talk about how to protect yourself against ‘Foreshadow’ intel CPU attacks. However, before going further let’s understand what’s Foreshadow and what is the effect of Foreshadow-NG/L1TF & Foreshadow. Both, Foreshadow- NG and Foreshadow are speculative execution which is a vulnerability of side-channel. SGX (Security Guard Extensions) is a feature of Intel CPUs and especially intended to safeguard the privacy and security. Moreover, it is also designed to defend the integrity of data and apps code from being targeted and continue the processes running with high privileges. Security Guard Extensions are maintained in cloud infrastructures to get the best out of it. As per the sources, Foreshadow requires a flaw in Security Guard Extension’s execution. The proper utilization of this vulnerability cyberattacks can easily be capable of accessing and gaining control of Security Guard Extensions to secure the data inhabiting in the CPU’s enclaves. What Security Experts Has to Say About the Loopholes? Security experts have exposed to a new method to exploit the speculative execution feature of Intel CPUs to leak secured data and evade memory security difficulties. Well, the name of the susceptibility is L1 Terminal Fault (L1TF) and mostly known as Foreshadow. It takes place with three different variations, wherein the first and authentic variation was detected by the KU Leuven University team experts along with the University of Michigan, University of Adelaide and Data61, Israel Institute of Technology. Foreshadow – CVE-2018-3615: responsible for affecting the Security Guard Extensions. Foreshadow-NG/L1TF – CVE-2018-3620: It is responsible for affecting the system management mode (SMM) and Operating system (kernel). Foreshadow-NG/L1TF – CVE-2018-3646: this is responsible for affecting Virtual Machines and hypervisors that run on cloud services. Also Read : How Safe Is Your Customer Information? Effect of Foreshadow-NG/L1TF & Foreshadow? The vulnerabilities have the power to influence cloud workloads as well as systems. It is especially for the infrastructures which are provided by Intel like Intel’s Core and Xeon CPUs. Wherein the Processors of AMD unknown as Advanced Micro Devices and runs on ARM (Advanced RISC Machine) doesn’t have any sign of being influenced or affected. According to the tech giant Intel, it is a forthcoming next-generation enterprise and client processors, which company is planning to introduce by the end of the year (2018) will also not be influenced by these vulnerabilities. As these vulnerabilities also have the capacity to leave an effect on cloud infrastructures, Virtual Machines, and virtualization environments, so the unpleasant impression can leave millions devastated. For now, the experts have only quoted that how Security Guard Extensions can be expended for by video streaming services Netflix, Blockchain technology as well as cryptocurrencies. The security loopholes can invite cybercriminals or users might end up compromising their credentials, encrypted private keys which are kept in the CPU’s enclaves. How to Protect Yourself Against ‘Foreshadow’ Intel CPU Attacks? The two tech giant companies Microsoft and Intel are working hard and announced its patched released to deal with the Foreshadow attacks on Intel Chips. Moreover, the cloud service providers and contributors have also provided fixes as per their own mitigations and patches to defend against the attacks of Foreshadow. Amazon Web Services (AWS) announced that ALAS-2018-1058 kernel has been updated whereas Google Cloud and Oracle also have made announcements regarding the same. Microsoft Azure also distributed extenuation for Azure cloud services and Linux and Windows VMs. Moreover, patches are offered for Linux Kernel. 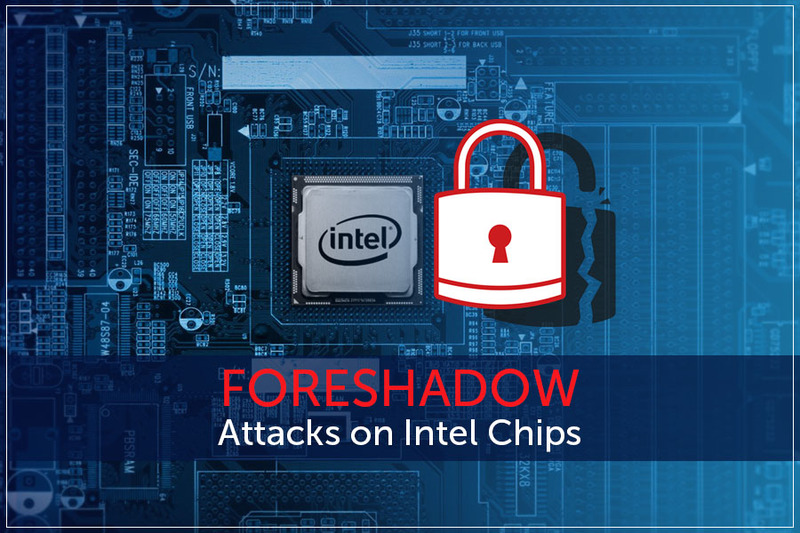 According to the security experts who disclosed about the loopholes, have also created a website that has all the required information about the FAQs, documentation and other necessary data for Foreshadow-NG and Foreshadow to deal with the Foreshadow attacks on Intel Chips. So, going through the website and gathering as much as knowledge possible is one of the best ways to protect yourself against ‘Foreshadow’ Intel CPU attacks. Also, installing the updated patch released by Microsoft is beneficial to eliminate such attacks in future as well.